This astronomer invented the spectroheliograph in 1889, which allowed him to photograph the sun in broad daylight. One of his main discoveries was that the sun had a sunspot cycle of twenty two years. He graduated from MIT in 1890, and started the Astrophysical Journal in 1895. He was the first astronomer to be referred to as an astrophysicist. He held the position of Chairman on Solar Research for the National Academy of Sciences. In 1899 he helped found the American Astronomical Society. He was instrumental in the creation of the Yerkes Observatory 40 inch Refractor telescope. 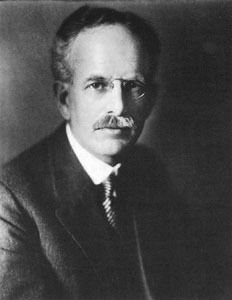 He founded the Mount Wilson Observatory and was its director until 1923. Hale worked to create Palomar Observatory, and in 1928 Caltech received a grant from the International Education Board. Work began on a 200-inch Pyrex glass disk to be used in the telescope at Palomar Observatory. Unfortunately Hale died before he was able to see the creation of the Hale telescope. Palomar Observatory was completed in 1948 and its telescope was named after him.